What a big boy @ only four months old. Frosty never met a lap he didn’t cherish. He grew a little more every day and yet pawed me to pick him up as though he were a tiny pup. We couldn’t resist. He was 13 years old when he died. Likes: Riding in the car, snuggling on the couch, hogging the bed, barking at strangers, watching kites fly through the sky, perfume samples in magazines, garbage, picking tomatoes and peas from the garden, and popcorn. Dislikes: Staying off the couch, medicine, being separated from his brothers. Frosty came into our lives because we thought that Grandbury needed a friend. We were gone a lot during the day with school and work, and Grandbury was having a difficult time acclimating to his new surroundings. The ferrets just weren’t the right size to pal around with. We felt he needed a sibling who could keep him entertained. We visited the local humane society and fell for the lone pup with the big head and feet that had obviously overshot the rest of his body. He was the last of his large litter. He sat alone, shivering in the metal cage lined with only a few newspapers to keep him warm. He was only four months old. He should have been with other dogs, learning puppy social skills. We asked to visit with him and took him to a little room where he immediately sat against the door and eyed us warily. Who could blame him? In his short four months of life he had only known abuse and abandonment. He wasn’t properly socialized, he was the last pup of his litter to be adopted, and he had already experienced human cruelty and irresponsibility. He stared at us with doubtful eyes. With a tone just above a whisper, I told him if he wanted a home where he’d always be loved and never forgotten, he was welcome to come home with us. Many “dog professionals” would have said that this introduction spelled trouble and he didn’t display the proper signs of a happy, well-adjusted dog. Said professionals dictate that a pup should show interest, confidence, playfulness, and a sense of well-being. Said professionals would have said to put this dog back in his metal enclosure and continue our search for a “proper” dog. Said professionals really should keep their opinions to themselves. And so, the lone pup lost his shelter name of “M.J.” and became Frosty, Frosty Paws. 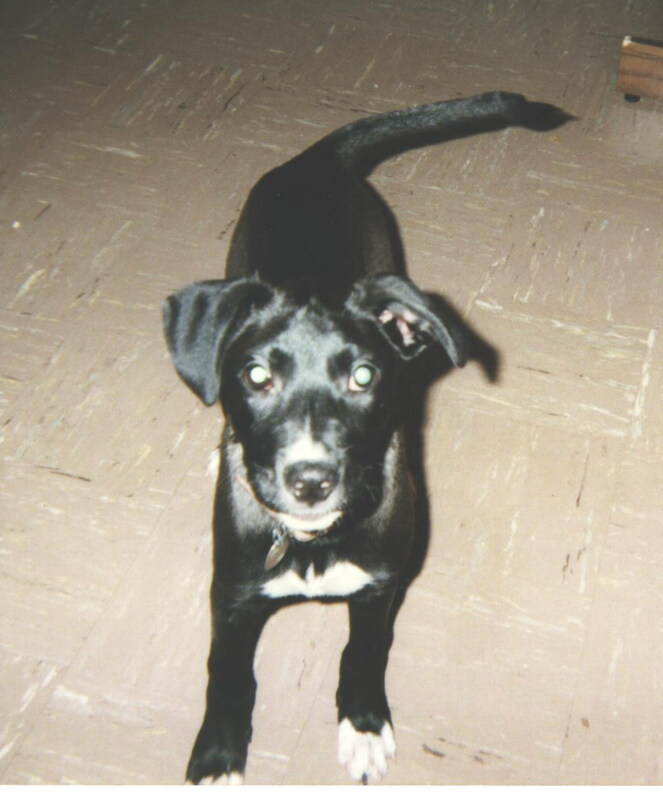 Our black Labrador/Dalmatian/Pit/who-knows-what mix was black, with a chest of white, and feet that looked as though they had been dipped in paint or covered in snow. He was Frosty, a jolly and happy soul. Grandbury wasn’t certain what to do with this being who had invaded his space. He towered over Frosty and would sniff him from head to toe. Frosty would roll around on the floor, enticing Grandbury to do the same. Should Grandbury take a moment to rest and close his eyes, Frosty found it was the perfect time to pounce on him and pull his droopy ears. Grandbury never seemed to care much. Oh sure, he barked, he fussed, but it was all a rouse. He truly enjoyed having this new little guy around and he took to parenting him as if he were one of his own. We never had to house train Grandbury. Not really. He understood the concept very quickly. He loved a walk, so he put two and two together pretty instantly. He was determined to teach Frosty the same lesson. Should Frosty forget to tell someone that he had to go out, Grandbury would “tattle” on him with his loud, boisterous bark. Frosty accepted that when Grandbury barked at him and wouldn’t stop, it usually meant something was wrong. Frosty took to his new brother Tristan more easily than Grandbury. It wasn’t difficult for Frosty because he was the baby and didn’t want to vie for the alpha position. He was more than happy to be the baby and let them two fight it out. As he aged, he was often the instigator of many disturbances, but would run and hide when the inevitable fight began. Tristan tolerated Frosty just as Grandbury did, with a sense of brotherly affection and love that overlooked the ear pulling and roughhousing. Only a few months apart in age, the two seemed to enjoy making “big brother Grandbury” exasperated by their antics. 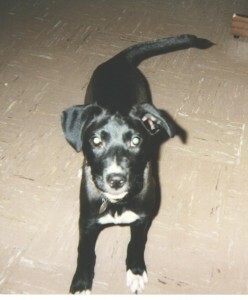 Frosty had few health problems as a pup. He was sensitive about people touching the tip of his tail. Someone had attempted and failed to dock his tail. It was clear this was a “do it yourself job” that most likely employed an attempted at hand-breaking the tail or slamming it in a door jam. They damaged it enough to break it and allow it to heal in a misshapen form. Frosty had two insatiable loves – food and water. His love of food never caused us any concern, other than making certain all packages were closed and out of reach. He wouldn’t rule out an unnoticed dumpster dive, so we had to take extra precautions to lock down the trash cans in the house. His water consumption was a different issue. Every visitor commented on his thirst. He drank a lot and consequently, needed lots of potty breaks. Somehow he got into this head that shaking your head no really meant yes and when asked if he needed to go outside, he’d shake his head no. You had better act quickly, because he didn’t allow for much reactionary consideration. We ran blood tests, x-rays, you name it, and there was never a culprit to be found that explained his rate of water consumption.